Even During Vacation Season, Offices Can Be Noisy Places : Shots - Health News Many employees complain that workplace chatter hinders their productivity, but maybe other office noises are the problem. The hum of an air conditioner might be presenting its own set of challenges to your efficiency. In offices around the country, the ranks of workers are pretty thin as people grab their last moments of summer vacation. For those of us left to toil in our cubicles, the absence of disruptions might seem like a help for productivity. So why is it still so hard to focus? 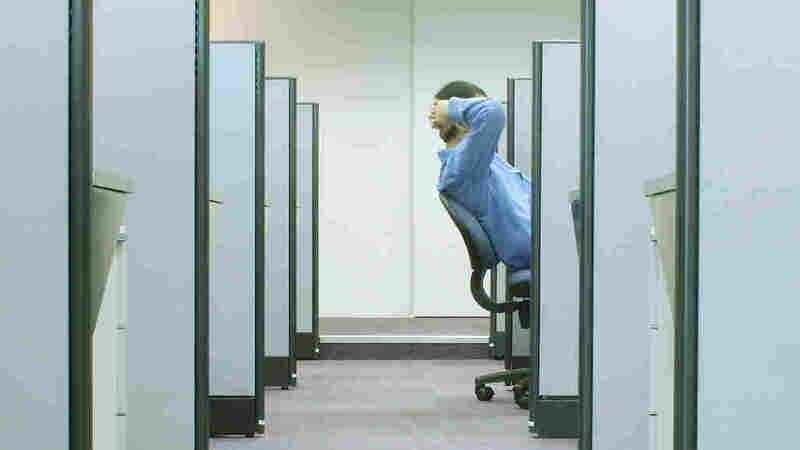 Though you're not listening to conversations and phone calls, the sounds of an empty office, like humming air handlers and buzzing fluorescent lights, can become increasingly noticeable in the absence of noise from co-workers. "We're designed to be listening...it's very hard to shut it off," says Jo Solet, a Harvard Medical School researcher interested in the health effects of sound. Solet says that we humans are adapted to respond to changes in our environment. Our senses alert us to danger and keep us alive. But they're also why we notice the sound of the air conditioning or tapping on keyboards in an otherwise quiet office. These office noises are low-frequency sounds, and are at the lower limit of human hearing. Some research suggest that they may have negative effects on our abilities in the workplace. A 2004 study in Sweden administered a written test to adults listening to recordings of heating vent noises common in offices. This group was less attentive, slower to respond to questions and more likely to answer questions incorrectly, compared with adults who listened to reduced levels of the same sound. When your brain is processing the buzzing and humming in the background, you can start to get sleepy, too. Sound familiar? "It produces a higher cognitive load, so it uses a higher level of concentration or effort to pay attention to your tasks...you can get fatigued," Solet says. Today, many offices encourage collaboration among co-workers with large open rooms and low, unobtrusive cubicle walls, says Frank Mruk, associate dean of the School of Architecture and Design at the New York Institute of Technology. Even New York Mayor Michael Bloomberg embraces the collaborative environment of the modern cubicle. But closed offices or high cubicle walls were better at absorbing all sounds, from your neighbor's personal conversation to the subtle sound of the air vent, Mruk says. However, even partitioned offices may not keep the annoying buzzing and humming out of your ears. Solet says that low-frequency sound is created by large, long waves that can more easily penetrate barriers than the short high-frequency sound waves created by chatty officemates. Both Mruk and Solet say that the best workplaces provide a balance between the quiet and the clamor, and that hearing some level of background noise is necessary for work. "[They should have] an ambient sound level that is protective, not intrusive," Solet says, "there is a moderate, low-level amount of sound that protects privacy [in conversations]." And architects, psychologists and occupational therapists are all working on that special sound formula to make us more awake, alert, and productive in the future. "It's about finding a sweet spot in terms of productivity," Mruk says, "a beneficial range of acoustics for work."